Advantech, a maker of server-grade memory, storage, and other components and solutions, is introducing a new lineup of 32 GB unbuffered DDR4 memory modules. Designed for high-performance computing (HPC) applications, the SQRAM-brand DIMMs use the latest DDR4 DRAM devices from Samsung, and feature additional reinforcements to make them suitable for industrial applications. 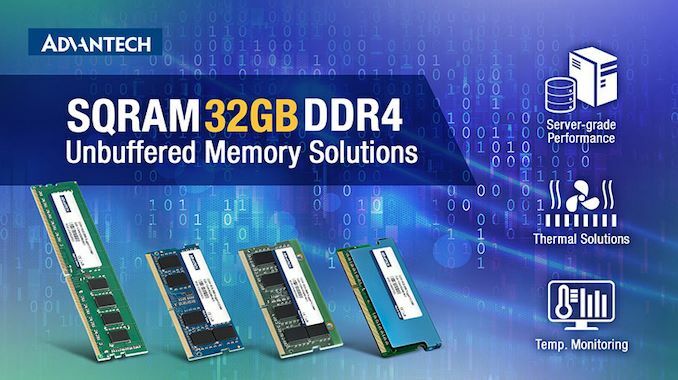 Advantech’s SQRAM 32 GB DDR4 modules are based on Samsung’s 16 Gb DDR4-2666 memory chips. Given their positioning, they enable system makers to easily install 64 GB of memory into machines with two memory slots or 128 GB of memory into machines with four memory slots, twice what's possible with today's common 16 GB DIMMs. Advantech's modules come in ECC Unbuffered DIMMs, Unbuffered SO-DIMM, ECC SO-DIMM, and Rugged DIMM form-factors. Along with class-leading capacity for an unbuffered DIMM, Advantech’s SQRAM-brand memory modules are also aimed at applications that require high long-term reliability. In particular, they're rated to withstand extreme temperature ranges (between -40°C and +85°C or between 0°C and +85°C), and they feature 30u micron thick golden connectors for extra reliability. The modules also come equipped with a heatsink and are supported by the company’s SQRAM Manager utility to monitor DRAM temperature and alert about overheating. Advantech will start sales of its 32 GB SQRAM DDR4-2666 memory modules in the near future. The company hasn't announced any official prices at this time, but as both high-capacity and industrial-grade DIMMs, they are very much high-end parts and will undoubtedly be priced accordingly. It's right there in the second sentence. "SQRAM-brand DIMMs use the latest DDR4 DRAM devices from Samsung, and feature additional reinforcements to make them suitable for industrial applications"